INS Kalvari is the first submarine in the P75 Scorpene Class. Image courtesy of Indian Navy. The INS Kalvari was undocked in April 2015. Image courtesy of Indian Navy. The INS Kalvari submarine was launched at Mazagon Dock in October 2015. Image courtesy of Indian Navy. The P75 Scorpene submarine project is scheduled for completion by 2020. Image courtesy of Indian Navy. The P75 Scorpene Class submarines are being built by Mazagon Dock. Image courtesy of Indian Navy. The P75I Scorpene Class diesel-electric / air-independent propulsion (AIP) submarines are based on the Scorpene Class submarines, which were designed by French naval shipbuilding firm DCNS in partnership with Spanish shipbuilding firm Navantia. The new submarines are being built by Mazagon Dock Limited (MDL) in Mumbai, India, using the technology and training provided by DCNS. 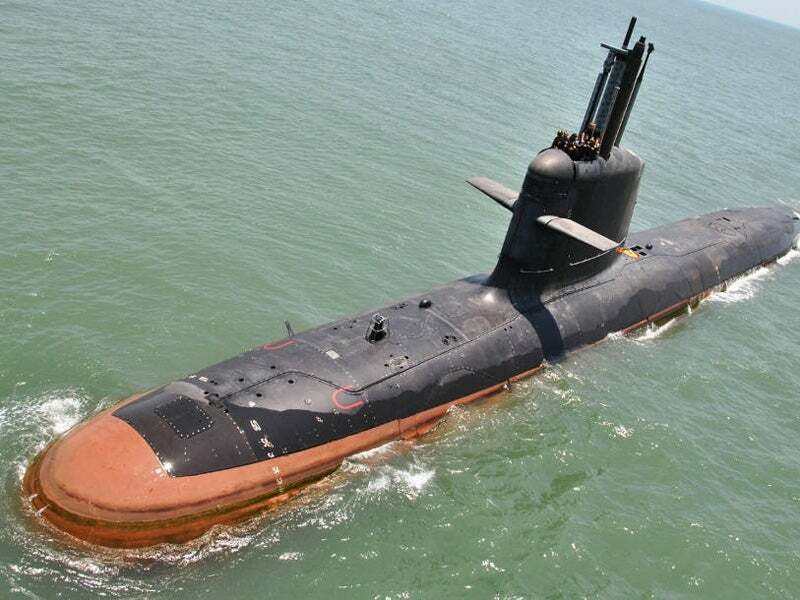 The Indian Navy intends to use the submarines for missions such as area surveillance, intelligence gathering, anti-submarine warfare (ASW), anti-surface warfare (ASuW), and minelaying operations. The first submarine in the class, named INS Kalvari, was undocked at Mazagon Dock Limited in April 2015 and was launched in Mumbai, India, in October 2015. Sea trials of the INS Kalvari were commenced in May 2016 and the submarine will undergo weapon, surface, noise and diving trials, prior to her commissioning in 2016. The Scorpene Class submarines are also acquired by the naval forces of Chile, Malaysia and Brazil. The P75I Scorpene Class features pressure hull and superior stealth capabilities. It accommodates between 25 and 31 crew members and 14 combat divers. The submarine has a width of 6.2m, a length of 67m and a submerged displacement of 1,550t. DCNS’ SUBTICS integrated combat system enables operation and control of all onboard sensors, weaponry and radars from multifunction common consoles. The motion of the submarine is controlled by a steering system using rudder and hydroplanes. The P75I Scorpene Class submarines are armed with six torpedo launching tubes, 18 heavy weapons, tube-launched MBDA SM-39 Exocet anti-ship missiles, and precision-guided weapons. The weapons are carried in weapon launching tubes (WLT) and can be easily reloaded at sea. The submarine can launch crippling attacks on surface and underwater enemy targets. The onboard S-CUBE integrated and modular submarine sonar suite, developed by Thales, offers increased safety against a wide variety of threats in deep or coastal waters. It comprises sonar arrays including bow, stern, planar flank, intercept, distributed, towed and active, mine and obstacle avoidance sonar, as well as self noise-monitoring hydrophones. The submarine is also equipped with Sagem surveillance and radars. The submarines in the P75I Scorpene Class are powered by conventional diesel-electric propulsion system. The last two submarines are expected to be equipped with air-independent propulsion (AIP) technology, which is developed by DRDO to provide long-range and extended endurance capabilities. The submarines are also installed with batteries. "The Indian Navy intends to use the submarines for missions such as area surveillance, intelligence gathering, anti-submarine warfare (ASW), anti-surface warfare (ASuW), and minelaying operations." The propulsion, electricity, auxiliary, and safety systems aboard the submarine are controlled using a platform management system (PMS). The attack submarines can travel at a maximum submerged speed of approximately 20kt and have the ability to remain submerged for a period of 21 days. The P75I Scorpene Class has a diving depth of more than 350m. Flash Forge India received a contract from DCNS India in June 2011 for the supply of equipment. SEC Industries secured a contract from DCNS India, a subsidiary of DCNS, to supply high-technological equipment for the P75I Scorpene submarines programme in September 2011. In March 2012, DCNS awarded a €50m ($65.9m) contract to SEC Industries to supply equipment such as hull hatches, ballast vent valves, weapons handling, storage systems, and high-pressure air cylinders. The command consoles are manufactured by HBL Power Systems.